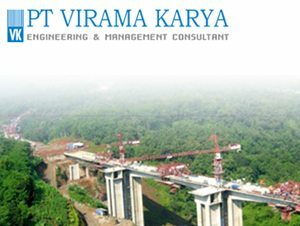 PT Virama Karya (Persero) - Virama Karya is a long standing state-owned engineering and management consulting services company in Indonesia. According to information found in Virama Karya's website as cited by JobsCDC.com, Virama Karya was first established in 1961 and initially registered as Perusahaan Negara (PN) Virama Karya. Virama Karya was formed by the Government of Indonesia as a nationalization results of Dutch company under the name of N.V. Architecten Ingenieurs Bureau Fermont Cuypers. The name of PT Virama Karya (Persero) officially launched in 1970 under the Government Regulation no 38 of 1970. Virama Karya has strong business competencies in technical sectors zoning, transportation, irrigation, agriculture, and specifically. Virama Karya is based in Jakarta and now has 4 divisions and 7 branch offices spread in all over Indonesia. Its branch offices are located at Surabaya, Semarang, Medan, Banda Aceh, Padang, Samarinda and Makassar. Virama Karya's head office is located at Jl Hangtuah Raya 26 Kebayoran Baru Jakarta. Background in Bachelor Degree (S1) in Civil Engineering, Architecture Engineering from a reputable and accredited university. The candidates with background in Master Degree (S2) in Civil Engineering Project Management is preferred. Minimum 10 years of experience as expert staff of Civil Engineering/Architecture Engineering. Possess expertise certification (SKA) MK – 601 / MP – 602 is preferred. Hands-on technical experience as Construction Manager/Team Leader MK. Background in Bachelor Degree (S1) in Civil Engineering from a reputable and accredited university. Minimum 5 years of experience as expert staff of civil engineering. Possess expertise certification (SKA) is preferred. Background in Bachelor Degree (S1) in Architecture Engineering from a reputable and accredited university. Minimum 5 years of experience as expert staff of architecture. Background in Bachelor Degree (S1) in Mechanical Engineering, Electrical Engineering from a reputable and accredited university. Minimum 5 years of experience as expert staff of mechanical electrical plumbing. Hands-on technical experience as Quantity Surveyor Expert Staff. Hands-on technical experience as Quantity Control Expert Staff. Background in Bachelor Degree (S1) in Architecture Engineering Landscape from a reputable and accredited university. Minimum 5 years of experience as expert staff of landscape. Background in Bachelor Degree (S1) in Environmental Engineering from a reputable and accredited university. Minimum 5 years of experience as expert staff of Environmental. Background in Bachelor Degree (S1) from a reputable and accredited university. Minimum 6 years of experience as expert staff of K3/Safety Manager/HSE Officer. Background in Bachelor Degree (S1) in Geodesy Engineering from a reputable and accredited university. Minimum 5 years of experience as expert staff of Geodesy. Minimum 5 years of experience as expert staff of Contract Law for construction project. Minimum 3 years of experience as expert staff/ civil inspector. Minimum 3 years of experience as expert staff/ Architecture inspector. Minimum 3 years of experience as expert staff/ mechanical electrical inspector. Minimum 3 years of experience as expert staff/ landscape inspector. Background in Bachelor Degree (S1) in Civil Engineering Landscape from a reputable and accredited university. Minimum 3 years of experience as surveyor. Possess expertise certification in the Surveyor (Technical Engineering Certificate) is preferred. Minimum 3 years of experience as Quantity Surveyor/Assistant Quantity Surveyor. Minimum 3 years of experience as Quality Control/Assistant Quantity Surveyor. JobsCDC.com now available on android device. Download now on Google Play here. Please be aware of recruitment fraud. The entire stage of this selection process is free of charge. PT Virama Karya (Persero) - Assistant, Inspector, Expert Staff, Manager Virama Karya March 2018 will never ask for fees or upfront payments for any purposes during the recruitment process such as transportation and accommodation.